Today’s collection contains various WordPress designs specifically crafted for large-scale industry like engineering, building and construction, machinery, oil and gas, equipment, renovation, factory, power, and other related services. Feel free to browse the themes to find what useful plugins are included in the pack, what features are available for the themes and what possibilities they can provide you with. You’re welcome! 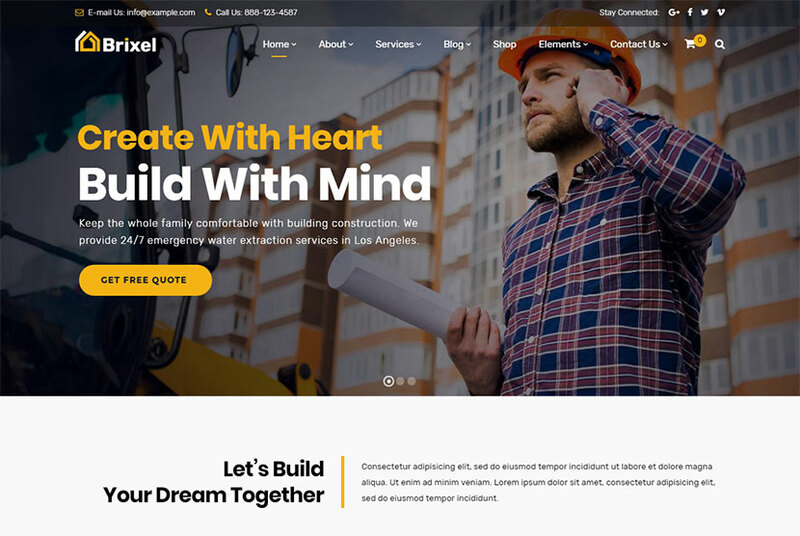 A professionally made WordPress theme that will become an optimal solution for building a website of a construction company or a tenant builder. The theme is stuffed with plenty of useful features allowing to create an engaging niche-specific online project. You can select from a few different homepage layouts to create an online tool to showcase your achievements, services and works. 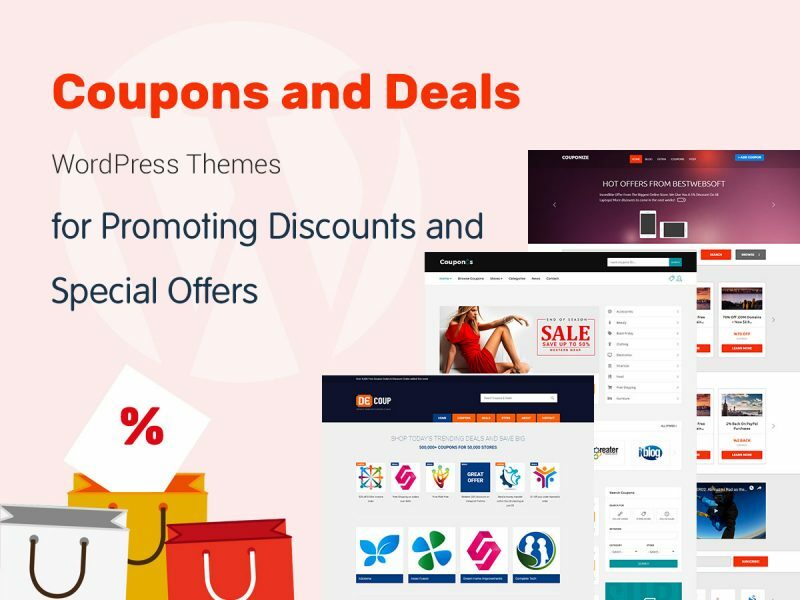 The theme also comes with multiple features like translation ready support, WPBakery page builder with ultimate add-ons, sticky menu, Revolution Slider, easy color management, different template types, and many more features. 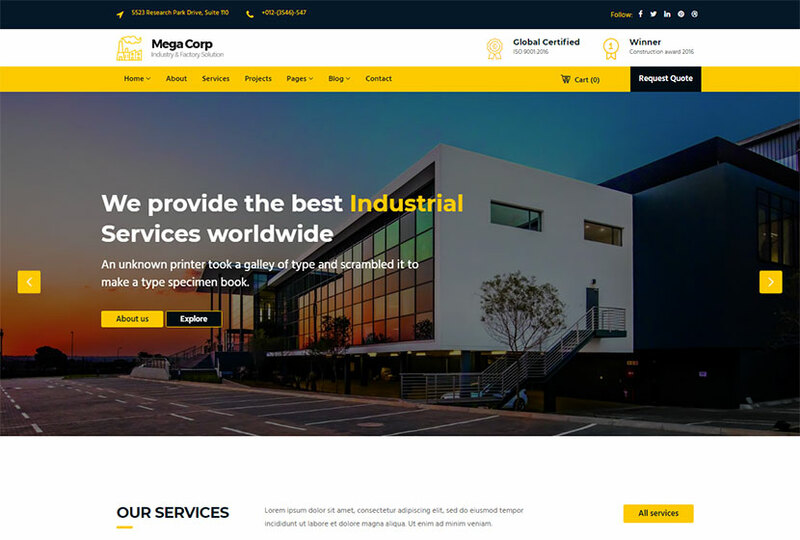 A minimalist and trendy WordPress theme made for engineering companies, factories, construction business and other industrial purposes. You can choose this theme for renovation, smart houses, home services, plumbing, building, repair, and other similar businesses. Thanks to the WPBakery drag-and-drop page builder integration, the theme is extremely simple to edit for users with zero coding skills. It also comes with the built-in Revolution Slider which allows to create beautiful showcases on any page. 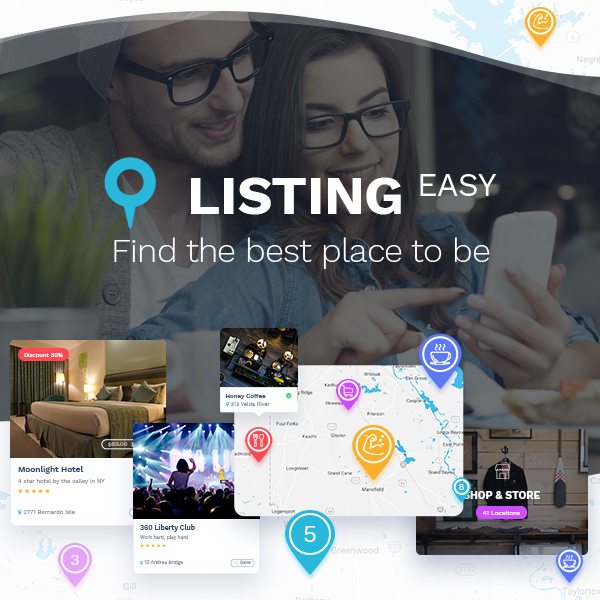 Built-in mega menu, sharp retina graphics, powerful theme options panel, blog standard layout, multiple carousel shortcodes, and many more features are also available. Another cool WordPress theme which is an ultimate factory solution for construction and large-scale industry. It comes with 6 homepage layouts to provide you with absolute freedom of choice when it comes to selecting a design for your future or existing website. The theme is available with a variety of great features and plugins like WPBakery page builder, powerful Vafpress framework theme options, Slider Revolution, WooCommerce support, Contact Form 7 compatibility, child theme support, advanced typography options, 6 unique header styles, valid HTML5 & CSS3, and many more advantages. A niche-specific WordPress theme created for construction, renovation, architecture, factory or industrial businesses. The theme comes with 4 homepage variations, so you can take any of them and change them up to your needs to create a unique layout. No programming skills are required for building a website based on this WP template, and this is possible thanks to the integrated WPBakery page builder plugin with drag-and-drop interface. 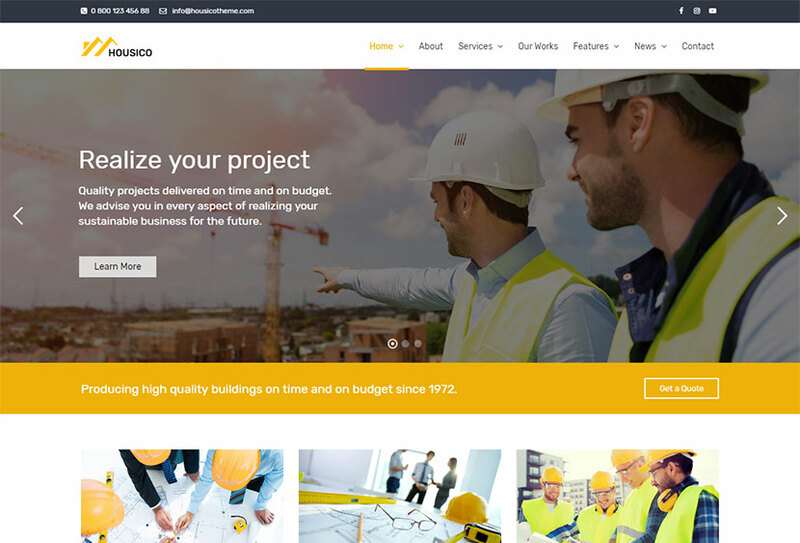 If you need to promote your engineering and construction services on the Web, Housico is going to be your perfect choice. 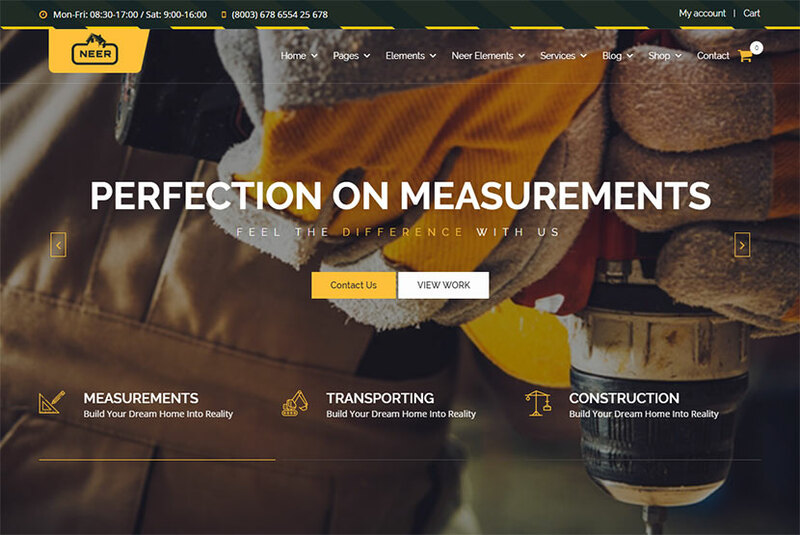 A construction industry WordPress theme which is going to meet the needs of building and construction businesses as well as engineering services. This is a feature-rich and versatile template which will be quite appropriate for creating a website both for a small company or a huge enterprise. The theme provides flexibility which allows to create a responsive and full-fledged website for promoting your services, sharing testimonials and achievements, showing off your portfolio and attracting your potential customers with ease. 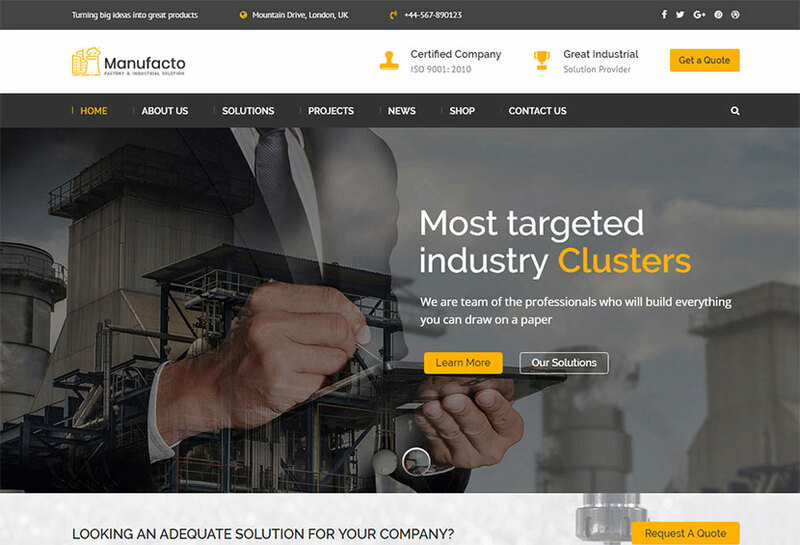 A WordPress theme especially designed for manufacturing and large-scale industries, factories and plants. The theme has got a number of pre-made pages including such as Projects, Blog, Testimonials, and more. You can upload custom content into pre-configured web-pages and present your firm as you want it to. The template is stuffed with a great amount of features including an intuitive and smart drag-and-drop King Composer page builder, Slider Revolution for building stunning showcases, WPML compatibility for translating a website, advanced typography for creating legible and easy to perceive posts, powerful framework with a lot of theme options, and many more coolest features. A trendy WordPress theme craftily designed for building and construction businesses. If you are in industrial construction and engineering business, you build private cottages and houses, or you are involved in municipal housing, this theme has you covered. The template comes both in light and dark styles, includes WPBakery page builder and Slider Revolution premium plugins, comes with .pot file for localization, custom header image for each page, live color changer, many options for changing colors, built-in shortcodes, custom post types project, custom widgets, WP customizer, and many more features. 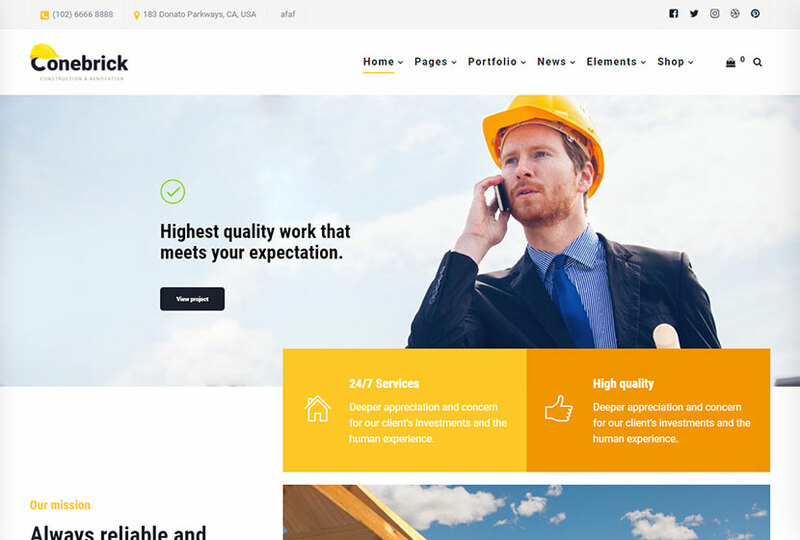 An ever-growing WordPress theme specially made for building and construction business as well as quite suitable for any industrial services company. Either small or large enterprise can choose this theme to build their corporate website or a business card. 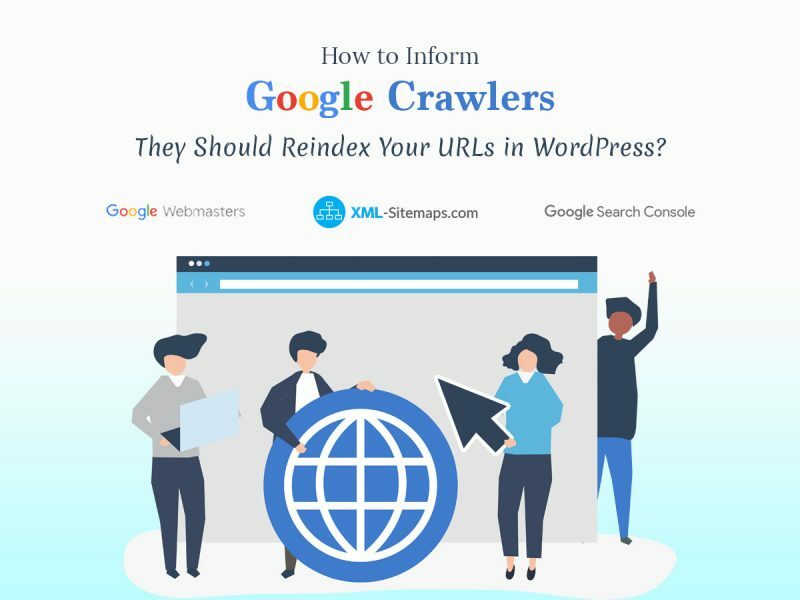 The template is built with WPTF which is one of the most powerful and advanced frameworks for developing modern websites with WordPress, HTML and JQuery. It also includes Bootstrap options panel, comes compatible with WooCommerce, powered by Hybrid composer, and includes much more important features. 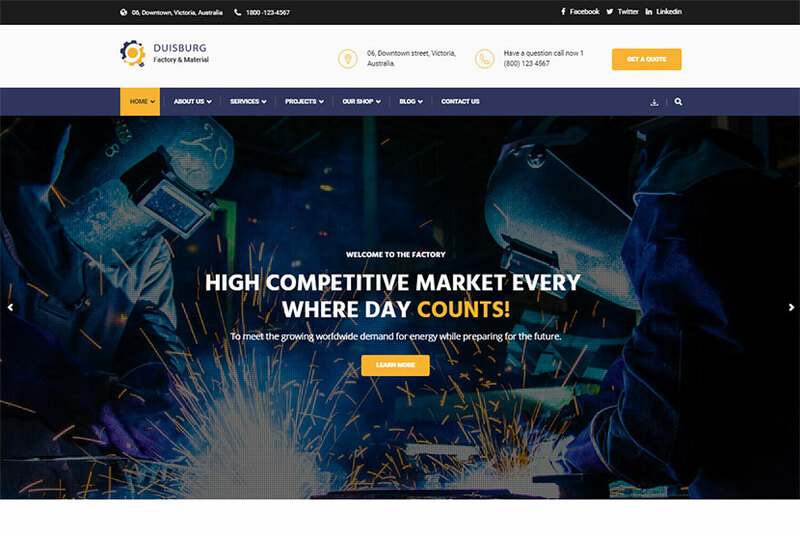 A WordPress theme specifically made for industry, factories, construction, engineering, machinery business, commodity business, oil & gas business, petroleum websites, etc. If you’re about to launch your startup, this theme has you covered. The template comes with unlimited color options, so you can change the color scheme of your website to your taste. It is compatible with plugins like Contact Form 7, WPBakery page builder and Revolution Slider, supports a child theme, powerful Redux framework options, includes 5 homepage variants and 5 header types, and boasts many more essential features. A WP theme which will be quite appropriate for industries like airplane building, machinery, engineering, construction, power, electronic, railway, and many more businesses. Start promoting your services with this theme, it’s easy. The template comes with numerous features which include King Composer page builder, 600+ Google fonts included, easy theme options, font awesome icons, WPML support, WooCommerce support, 3 header options, Contact Form 7 integration, preloader enable/disable option, sticky header, MailChimp newsletter, custom widgets, unlimited color options, and many more features. 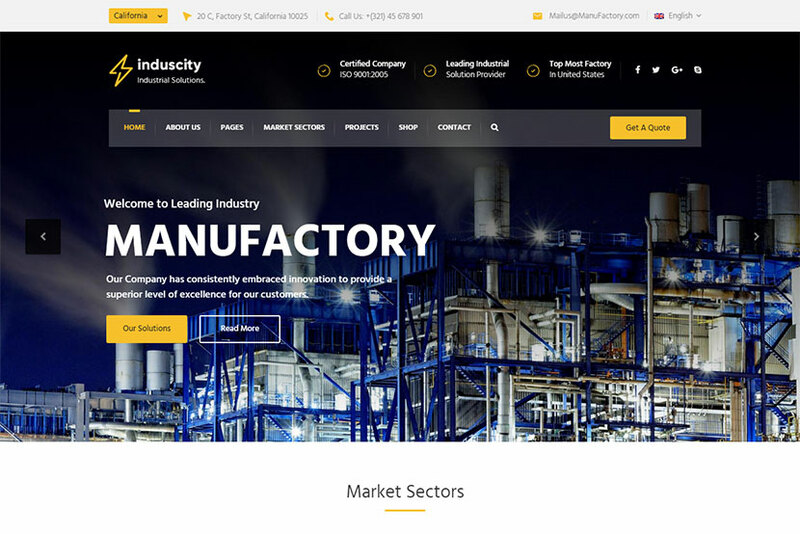 An industry and business WordPress theme developed specifically for all types of technology, industry, engineering, or machinery businesses. You can use it to create a comprehensive corporate website or a small business card for factories, plants, electricity and energy services, high-tech manufacturing, and more. The features of the template include 3 unique homepages, 3 header styles, WPBakery page builder, WooCommerce support, advanced typography, pixel perfect design, awesome unique look, smooth animation, Contact Form 7 compatibility, and many more advantages and possibilities. 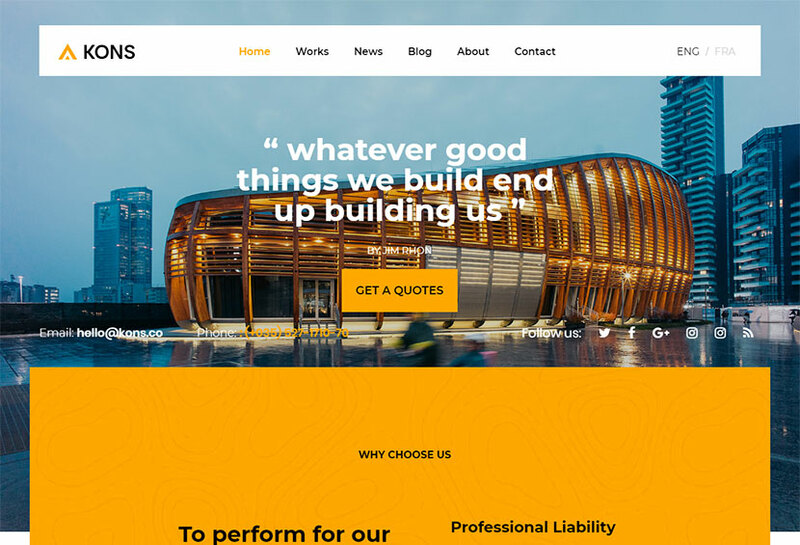 A WordPress theme optimized for construction, building and architecture industry. This theme is quite suitable for building a contemporary design business website with exceptional simplicity. It comes with 2 design concepts built with strong focus on usability & user-experience. It includes multiple header & widgetized footer layouts, unlimited sidebars with 20+ custom widgets, fancy page headings with amazing backgrounds, parallax & video backgrounds, built-in mega menu, enhanced isotope grids, infinite scrolling & load more pagination, smooth scroll, and many more features. 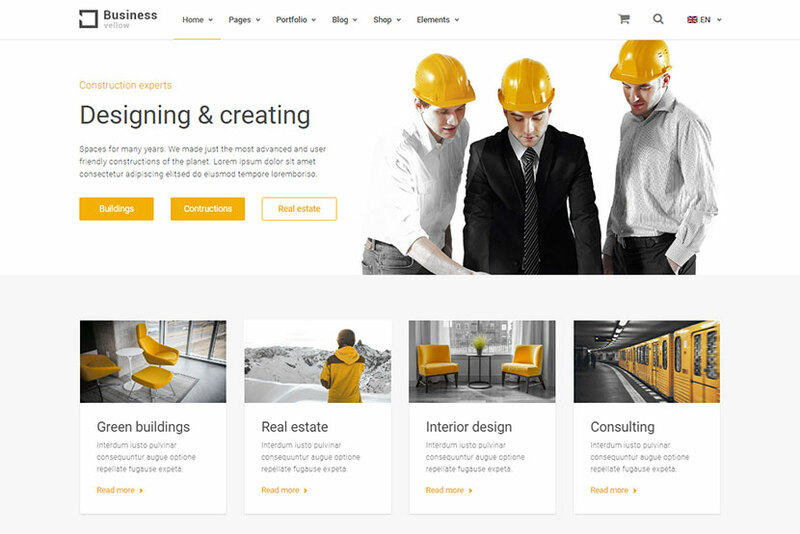 A WordPress theme quite suitable for building, construction and architecture business. You can also choose it for machinery, power, oil and gas, electricity, and other related purposes. The template comes integrated and compatible with multiple plugins and solutions like Redux framework with options, MailChimp, Max Mega Menu, Magnific Popup, WPBakery page builder, and many more. It also comes with a multitude of features like child theme support, custom forms and add-ons, translation ready support, and many more. 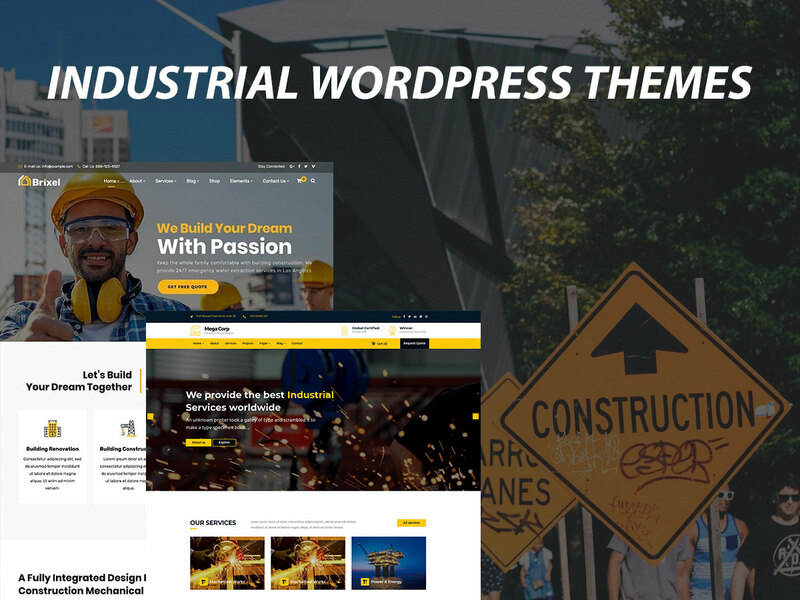 A niche specific WordPress theme made for any industrial sector including building and construction, engineering, machinery, architecture, power, oil and gas, foresty, agriculture equipment, and more. The theme comes with front-end Beaver builder which comes with drag-and-drop interface and allows to observe the changes in real time mode on the front end. It contains extensive setup guide, customizable mega menu, WooCommerce integration, 10+ portfolio layouts, 4 distinct header styles, preloading effect, powerful theme options panel, and any more features. 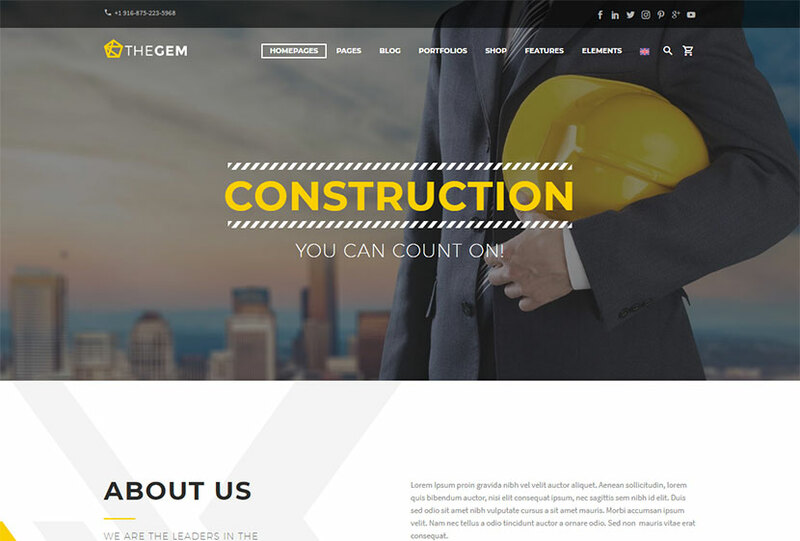 A WP theme for a company or enterprise engaged into construction business. 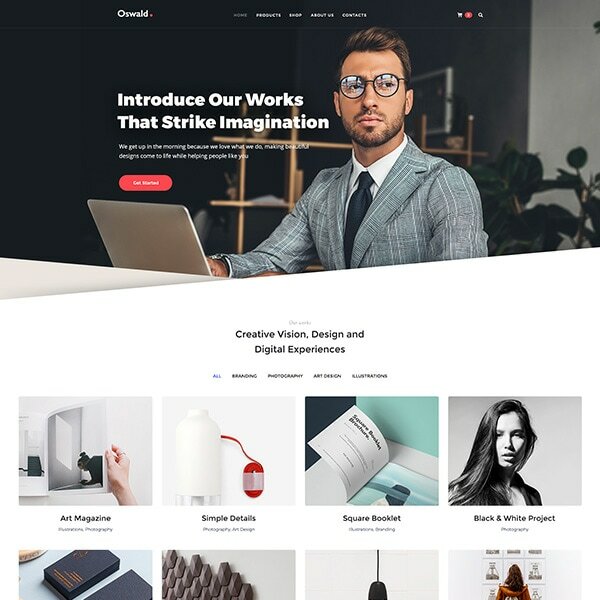 You can use this theme to build an innovative and attractive website thanks to its striking design and remarkable features. The template includes WPBakery page builder and Revolution Slider premium plugins, 4+ blog layouts including large image, list, grid, and carousel, 4+ project layouts like grid, masonry, carousel, metro, Live Customizer, unlimited colors, sticky header, WPML support, smooth CSS3 animation and parallax sections, WooCommerce, Contact Form 7, and many more features. 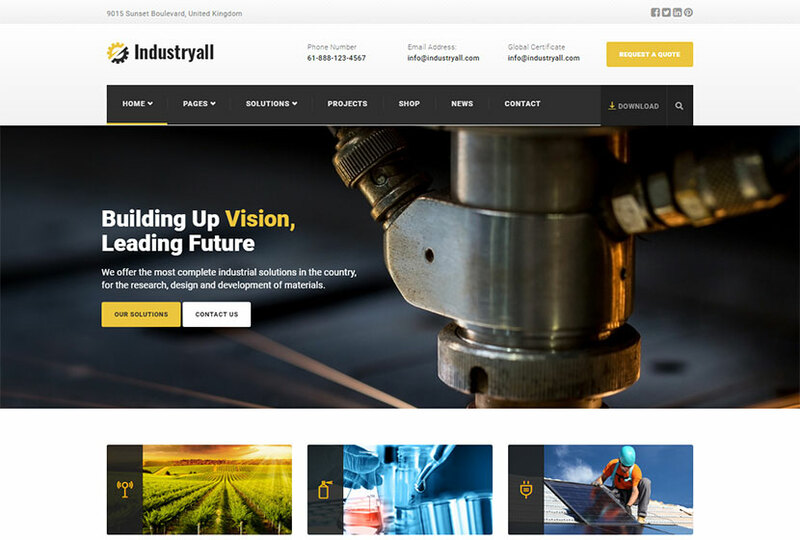 An industrial business WordPress theme specifically designed for all types of technology, engineering or machinery businesses. 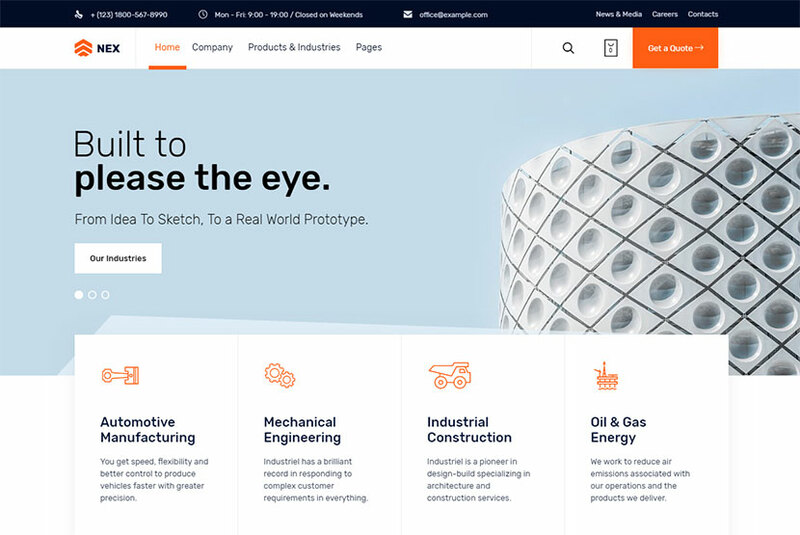 Construction, architecture, airplane engineering, large-scale industry, chemicals, electricity and energy, and other services are possible to be presented on the web pages crafted with this theme. The template comes with flexible layout, unlimited sidebars, custom and customized WPBakery page builder components, advanced admin panel, bottom footer widgets, advanced typography, custom page templates, pixel perfect design, child theme included, easy customization with variable content sections, custom built theme & page options, and many more features. Stay tuned for more WP theme collections for almost any niche-specific purposes currently required by website and business owners.